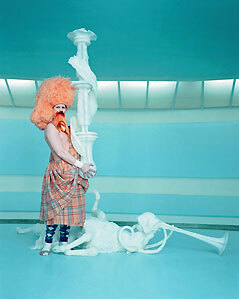 Matthew Barney, he disappears more in the stills than in the Cremaster films. But is it sculpture? aradoxically, one of the best ways to disappear is to become a very visible, highly developed visual artist. This happens even if the images of the artists themselves are the main visual material. I love how visual art objects tend to overshadow the artists who make them. Within that disappearing dynamic lies a lot of the enduring appeal and charge of the visual arts  the immolation of the artist into a complex sign. When the art is successful, what is left of the artist becomes iconic  something bigger than a mere human. Once a work is finished, the distilled aesthetics of the artist are no longer a moving target and the artist becomes merely another viewer. At that point, each subsequent viewer is a subjective stargazer who catches a glimpse of the work as it makes its way across the night sky. In the end the artist is just a catalyst and in many cases one can ask, "Is the artist just a rocket destined to burn up on re-entry?" Answer: the art is the payload! As a rule, better artists create work that literally forces them out of the picture. Sculptor David Eckard's crawl, art vs artist? That's why I avoided David Eckard's performance at the Art Gym. He can try to recapture the spotlight, but his big Tournament (Lumens) pieces still overshadow him. It just seemed like a pointless and self-indulgent exercise, so I went to Lewis & Clark College instead. I get it. But quasi-Dionysian group spectacles do not interest me much. The photos of Eckard's performance are pretty interesting, though. Maybe I just lack patience? Eckard is making a point about the rigors of his chosen path. But in this case it's preaching to the choir. Mixing performances with objects is always sticky business. It's possible I'll feel different next month after I've seen Matthew Barney's "Cremaster 3" film and exhibition at THE Guggenheim. I consider Frank Lloyd Wright's museum to be the toughest test room in art, and I want to see how Matthew Barney holds up. Will it be histrionics, or genius? Then again, maybe the whole cloth of his work is something more mundane? Can Barney disappear in relation to his prop sculptures on display? Are his films sculpture as he claims? Well, sort of: the stills from the Cremaster films are more iconic and enduring than the slow-moving films themselves and, thus, act more like sculpture. By being so slow the films are like mimes trying to be sculpture. There is a difference, but Barney initially fools a lot of people. That initial ambiguity has drama, but it gets spent as aesthetic capital. This disappearance of the artist into a sign isn't unique to the visual arts, but nowhere is it more developed or expected than in painting and sculpture. Despite this, disappearance of the author or performer is a widespread goal that never really happens in moving or time-based medias. Good painters always become secondary to the work; good actors attempt to disappear but the notoriety of the performance makes it impossible. Why care about the artist if you already have the art? Conversely, a performer lives on the pregnant possibility of another great performance. Object-makers take a back seat to the work, performers are front and center. In literature, Kafka's "The Hunger Artist" explores an aesthetic parallel where the hunger artist eventually perfects his art of fasting so thoroughly he becomes unnoticeable, even to the hungry beast that is introduced into his cage. Still, we are aware of our dependence on the the narrator's words and the writer's various revelations in the flow of the story. Most visual art objects do not make those specific sequential and procedural demands. Sequential demands assert authorship. 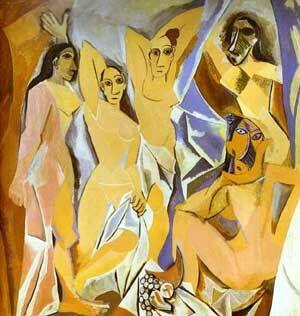 Picasso's 1907 "Les Demoiselles d'Avignon" ... the artist as a presence is supplanted by the viewer. If authorship is too incessant it spoils the flavor of the aesthetic meal. I think that's why Mark Rothko stopped signing the front of his work. For example, does anyone really get too troubled over what Gaurnari thought? No. His violins are all we care about, that and the instruments of Stradivari, his star pupil. I got to play a Gaurnari once; they really are better. Another reason I don't buy the postmodern cult of individual ineffectiveness: I have felt the difference. We need to move on. Thus, at a certain point of mastery, an artist starts to disappear and becomes a footnote to the work. Yes, the moral implications of this "disappearing" dynamic are scary but that, too, adds a special cultural tension for those reaching for the brass ring. A prime visual example is Picasso. As a historical character he's an interesting, charm-filled misogynist with legendary woman troubles. Still, his paintings overshadow those soap operas by distilling the dynamic into something more than two people having either a good or a bad time. He absorbed Baudelaire's sense of nuanced ennui and it showed him a way to supersede his own presence in the work. In the most important painting of the 20th century, Picasso's Les Demoiselles d'Avignon, even the prostitutes are no longer selling themselves. They are selling a troubling idea that "this" is art. Picasso himself barely understood it at the time, but was brilliant enough to know when to stop tinkering. As it is now, the canvas asserts itself above the artist; it is notoriously unresolved and doesn't much pander to any world view. Conversely, lesser art is too subject to the artist's prejudices. Les Dems was way ahead of Picasso's own prejudices by 10 or more years. not the other way around. Morally, it's quicksand. But that's why the drama works. We don't live in a perfect world; Picasso's paintings distill the tension of imperfections and perfections. The final product is an opportunity for pure subjectivity in the viewers gaze. Other artists, like Jackson Pollock and Marcel Duchamp, were utterly obscured by the infamy of their techniques: the drip and the ready-made. 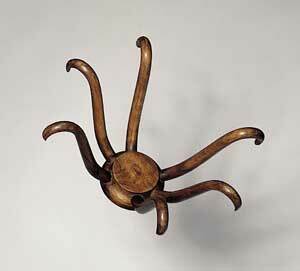 Marcel Duchamp's "Hat Rack" readymade. British artist Damien Hirst knows and loves the fact that dead animals in formaldehyde supersede him. He makes objects that present dead things and are ultimately more interesting than his own eventual demise. Death is kinetic force in visual art. Overall, it's amazing how some artworks become more individual and unique than those who created them. Even when the effect is unintentional, art objects transcend, compact and highlight elemental tensions from the artist's life ... the equivalent of an avalanche started by a noise. As "the noise," the artist is important as a catalyst for releasing the kinetic potential of visible things. The art runs its course after that, usually burying the artist if it is a big avalanche. In bad art, the work reveals how those elemental tensions are misinformed as to their own nature and scope. Not that such work is useless; it works instead as therapy. Is therapy a cultural product worth preserving? Rarely. That would be like recording only a beginning student violinist doing scales, but not their brilliantly improvised cadenzas to Vivaldi's "The Four Seasons" years later. It's understandable though: human beings have daily concerns, and art objects can just "be." Whereas performance artists like Martha Graham and Jimi Hendrix never let you forget that you were watching Graham dance or Hendrix play guitar. Nobody has danced or played like that, before or since. When one views a painting the artist isn't in direct view, even in self portraits. Painting and sculpture are Machiavellian. The end justifies the means. Julie Mehretu was "Out of Sight"
Mehretu's Retroscopics: "A Renegade Excavation" (18 feet wide). Today's hot artist, Julie Mehretu, had her most ambitious painting, "Retroscopics: A Renegade Excavation," on display at the Henry in Seattle. Sadly, it's gone now. Frankly, you are foolish if you missed it and consider yourself at all serious about painting or drawing. It was part of a show about fictional spaces, yet another show on that 2002 topic du jour, "the city." The show was good and beautifully laid out. Still, the Mehretu was definitely the conceptual and aesthetic lynch pin. The painting fits the complex Zeitgeist of right now, where we try to get a handle on a world with too many variables to fully take in. In heavy theoretical terms, it's beyond postmodern isolation and deconstruction; it's additive, cumulative and collaborative. May most of the second half of the 20th century burn in a hell mapped by Mehretu. Her work is a nice synthesis of Kandinsky, Futurism, Frank Lloyd Wright, James Rosenquist and Roy Lichtenstein. Nothing could be further from Cyndy Sherman. One interviewer in Flash Art called it "post-diagrammatic," which wins my masturbatory pseudo-meaningful jargon award for 2002. 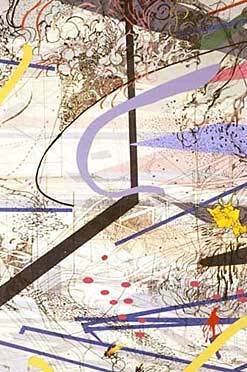 Still, such silliness often requires a serious muse, and Mehretu provides the praise-deserving impulse. "Retroscopics": a Renegade excavation (detail). "Retroscopics" does fit Robert Storr's classical (i.e., so far unoriginal but valid) interpretation of the grotesque as a fusion of disparate elements, but it still has some of the aesthetic oohs and ahhs of Dave Hickey's ideas on beauty. Yet the painting has flaws, as most shockingly original work does. It works best up close and lacks oomph from far away. It isn't this century's Les Demoiselles d'Avignon, but it might be on par with Van Gogh's "Sunflowers," as it points strongly toward a different clarity not present in the actual work. 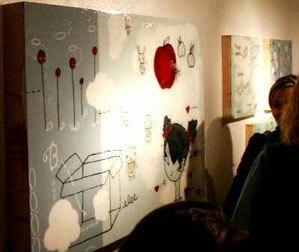 The painting maps the effects of a multitude of individuals and cultures colliding and interacting. The thing looks like a car crash between the present, past and future, but without individuals. I think I can see the seatbelts though. "Retroscopics" is all impersonal visual efficacy without cause, a chaotic order chronicling both building and explosions. 9-11 has nothing to do with this? Yeah, right. One disappointment: the skin-like background translates better in reproductions than in person, like on the cover of the Flash Art Magazine. Mehretu solves this problem in other works in different mediums. After close inspection, where all the details shine, one might ask where is Mehretu in all this? Who cares. Her personal statements about complexity in her work are almost too analytic; a rhetorical style that seems to say to her interrogator, "Just look at the damn thing." In "Retroscopics," Mehretu is drowned out by the sweep and breadth of her enterprise, an 18-ft.-wide behemoth. She is concerned with things bigger than herself: war, diasporas, the building of cities and time. Of course she's upstaged. She has the wisdom to let her process and style take over when her intentions reach their limits. Sunday's sunny art outing to Lewis & Clark College's François Morelli show was tops. I love this campus and its gallery. Morelli's serial use of 70 different rubber stamps to create 133 feet of endlessly anthropomorphic undulations was excellent  an analogue of language not unlike Paul Klee's drawings of cities. Although it lacked Klee's penetrating poetry, it still held my attention for a time and I really enjoyed how Morelli used symbols of life (trees), death (needles, skull and crossbones) and expression (money, scissors and violins) to create continuity within the gallery space. Francesco Clemente also uses needles, skulls and scissors as signs and puts them to good effect, too. Overall, "Carousel" provides an endlessly looped procession of signs, an anthropomorphic meta or possibly pre-hieroglyphic language that underscores the recurring nature of human enterprise. It is more hip-hop in its sampling than Clemente and Klee. Is that good? I answer with the question, do you like hip-hop? Not to be pretentious, the nice blue color scheme provokes reflective thought. Just go see it, what "Carousel" lacks in raw originality it makes up for in a feedback loop of macrocosm and microcosm. Joe Macca: "Night Paintings" and "I Virus"
Joe Macca's latest show is a lot more brooding and complex than his last show, "Hedz." In this latest outing, Macca's paintings hover like sublime memorials to the universe as it was before stars. 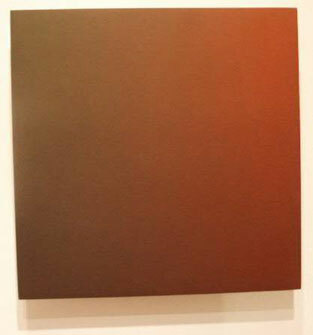 There is a romantic asceticism where viewers lose themselves in the subtly shifting browns and reds of the color fields. In the past, I liked the work but found it a bit too systematic. The code was too easy, like hacking a computer system with the first name of someone's youngest child. What's different this time out is how moody the effect is: Instead of the bright, distinct, horizontal bands of colors from the past, we get deep loamy toned, mysterious nebulas. There is a sense of indefinable but palpable differences in density, yet these paintings are resolutely flat. These Night Paintings vary in shade and color in a looser, more unpredictable way. They are infinitely easier going than the Hedz. Sort of like a Zen master vs. the flashy monks, training in the courtyard. Unlike all the moody encaustic we often see regionally, Macca's surfaces are resolutely dry and do not attempt any shrouded depth in their fuzziness. 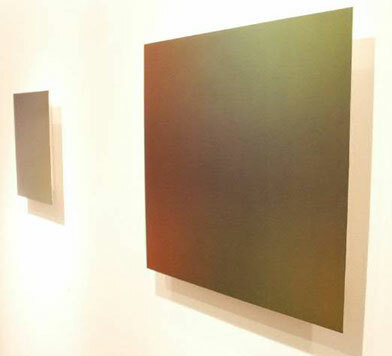 Another nice touch of these Night Paintings are their direct and mysterious knifelike edges made from cut aluminum. Much like the truth, they cut the visual field to ribbons without much hoopla. It's a highly successful show and they make the PDX space come alive and lift the architecture by Brad Cloepfil a notch or two. Instead of the typical ironic postmodern icebox gallery experience, Macca transforms this into a temple. To my mind, this is the first time Macca has consistently pushed us beyond the experience of color into the experience of otherness. There is another part to the show, "I Virus." A dramatic shift from the Zen void of the "Night Paintings," "I Virus" consists of bravura and witty delusions. In "Art Tournament," Macca is the eighth seed in a tournament against greats like Agnes Martin, Matisse and Duchamp. Hilariously, Macca beats them all. How so? Macca is learning and taking from them. I am certain Agnes Martin does not lie awake at night with clenched fists saying, "Damn you, Macca." But Macca should have the last word, and is collecting them as influences. Another hilarious piece showed a map of the United States much like those for presidential election results. The candidates: Macca, Frank Stella and Thomas Kincaid. Of course, Kincaid took every state! 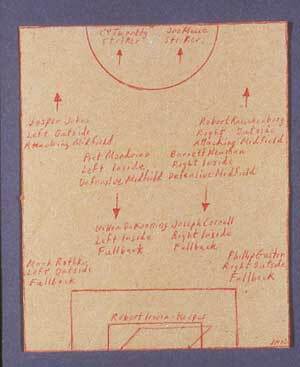 Macca's "Starting Eleven" Robert Irwin a goal keeper? ... Madness! As PDX's director points out, Macca and Stella failed to carry their home states. Sometimes it is not about winning, but what and how you win. "I Virus" is not the main show, but it does show how an artist can be self-effacing yet absorbingly engaged with one's own life. Macca shows that American attitude and Zen absorption are not such unlikely bedfellows. Many of the young self-effacing yet self-absorbed artists in Portland could learn so much from Joe Macca's jokes. They are funny, but they have engaging personal consequences that the artist is unafraid to put on display. The main course of "Night Paintings" are an absolution and a compression of Macca's concerns and ideals, but are presented in a way that extends the horizon instead of shrinking it. Well played. Ayo's "Flesh Room," another engaging disappearing act. 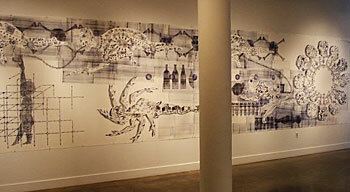 Damali ayo had an excellent show in Seattle at the Center on Contemporary Art (CoCA), called "Skinned." It really shows a lot of her range as an artist. 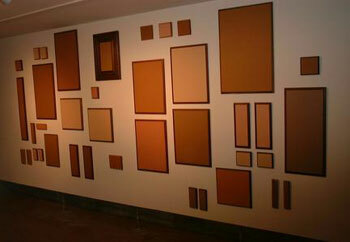 In "Flesh Room," a space painted her own skin shade, her art literally obscures the artist like camoflauge. In that room, she disappears somewhat while standing in front of the wall. Nice touch. It's about how basic skin-shade characteristics overshadow people. Yet when people who do not match her shade stand in the room the difference stands out all the more saliently. The point? Color matters but it is up to the viewer to subjectively determine how. Overall, "Skinned" is pretty nuanced and aesthetic. Its genesis occurred in a paint store where the staff was continually asked to match colors. Ayo, being the imp she is, simply asked to match her skin tone. In the second room, ayo arranged a multitude of skin-toned surfaces with dime-store frames. The effect is concussive: ayo as an artist has completely disappeared into a sea of flat, droll distinctions about skin tones. A real showstopper. It's easy to get used to as art. However, does it really change people? Probably not, unless it's put in increasingly public spaces. But as Victor Frankl pointed out while accounting his ordeal in the holocaust, "A human being can get used to anything." Ayo's display of variety is at least part of the solution. I last wrote about Trish Grantham in September 2001. Her works are still "untitled," but have gained a greater clarity after some experimental forays with newsprint and acrylic polymer. I particularly love the almost robin's egg blue that all the works share for a background. it's for young single people who need to explore basic life questions, age 21-38. 1) who to love, who can love? 2) where to move, where to stay? Seems pretty simple, except there is an intense cynicism infused into the work and that complicates everything. It looks a bit like a good pop song sounds. she isn't her work, but I'm certain her whip-smart cynicism was the catalyst for the work. Once again, the artist takes a bow offstage. We don't learn much about Trish through the work, but it speaks for an entire demographic  particularly those who search for "their thing." It is valid but can be tiring when forlorn words are woven into the painting surfaces. Leave it more ambiguous. 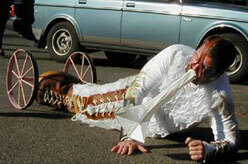 Trish didn't enter the Oregon Biennial, feeling she wasn't quite ready. It's that kind of assessment that will eventually make her better. We'll keep watching this one  right now she's already better than 90 percent of the entries who didn't recognize their flaws. Trish's work will come of age when the narrative leaps from its age bracket and holds true for all. Amos Latteier incorporates basic laptop presentation techniques into art performances. I really like the subversion of the office tools for art, but on a critical level Latteier needs more results for his presentation to take off (cough). 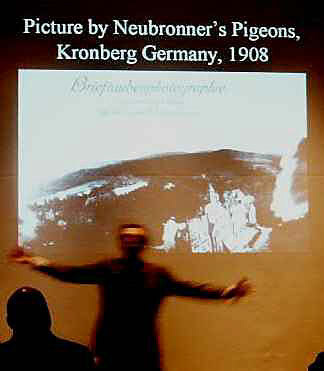 Latteier gave a lecture on flight-based photography with special emphasis on pigeon photography. His mad scientist/hobbyist earnestness was infectious, recalling Bert from Sesame Street, who sang "doin' the pigeon" with no sense of irony. Latteier is not so much postmodern. Instead he is pre-success in the best possible way. He doesn't really have command of his subject matter, but one senses the day will come. A postmodern presentation would simply insist that man and pigeon are somehow destined to ineffectual, imperfect enterprise. Instead this Power Pointillism is more like early science, a form of trial-and-error empiricism. Think: the New Organum ... broadcast. As art, its infectiousness and lecture format recalled Beuys, Yves Klein and Luca Buvoli's recent work at PICA. The only real problem is that it was obviously a project in medias-res with some pretty excellent blurry pictures that Latteier didn't like much. I liked 'em; real ambiguous and Latteier's plausible explanations were good, too. But they lacked punch. The problem lies in how little material the presentation had regarding the pigeon-based photography. The unknown aspects of the journey were the best part. This is process-art in the guise of a lecture. At this point in his development, Latteier is both the artist and the medium. Whereas with more photos from the pigeons, maybe 20/50, we would see it more as a collaboration. Then our view of Latteier would become a presentation on the evidence the pigeon brought back. With a critical mass of material, the art would overshadow the artists (pigeon and Latteier) and gain more efficacy. William Wegman went through a similar thing with his early films, though I do not wish Wegman's current Chrysler-ad hell on Latteier. Then again, if this is just a hobby and not intended as art, then by all means make Ford ads and feed the feathered friends. There is nothing wrong with turning one's hobby into a career. All careers have rules, even art. As long as you're a mad scientist making a Frankenstein, ultimately beyond your control, it is still art. The second you clone Michael Jordan and deliver the new young Jordan to the NBA, you have just become a sane, pragmatic scientist and the ad world's favorite person. At that career point, it would be nice to begin collecting some art.